This year 2013, a disastrous year due to earthquakes on several part of world, mostly on the line of fire. Most of the large earthquakes were not inland earthquake but few did most damage like in Pakistan, Philippines, Iran etc. on 24th, 28th September in Pakistan and 15th September in Philippines rocked by destructive inland earthquakes and claimed more than 750 people. Some photographs of Philippines earthquake can found here. This year, due to earthquake tremor a new island appeared near Pakistan coast line. 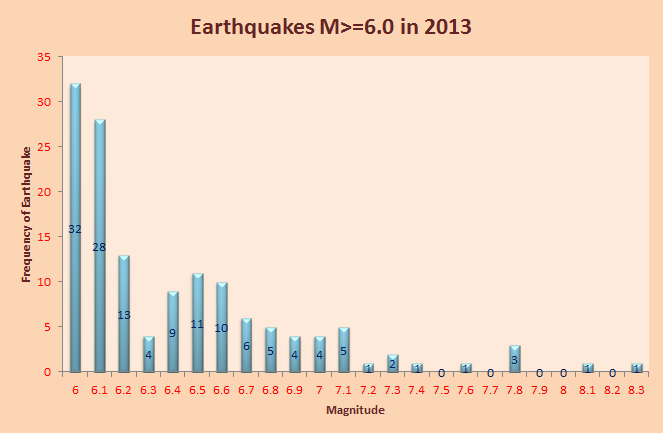 Total no of 141 earthquakes recorded during one year having magnitude level more or equal to 6.0. Even significant earthquakes as categorized by USGS, from magnitude level 4.0 are 81 nos having some level of damage. Here for significant earthquakes, measuring the shaking level and its effect to the community are considered, so large earthquakes are not also listed where even magnitude 4.0 listed. Mostly inland earthquakes are listed as significant earthquakes. Tsunami having height of about 1 m generated around Solomon islands with few level of damages but not so large as previous devastation of Japan 2011, Indonesia 2004 etc. this year. Almost all of the casualties were due to poorly constructed structures, Collapse of structures and buried by them is the common cause to rise in death toll. Most of the casualties due to such reason pointed dense number of deaths on developing and under developed countries. As earthquakes are like bullet in such countries. Seismically strong and economical structures as shelter of poor people must have to be in priority on parallel with giving them awareness about cause, its risk and way to be safe to reduce the death toll which densely falls on developing and underdeveloped areas.